Get Approved † for the Credit You Need in Less Than 60 Seconds with the Applied Bank Secured Visa Card! 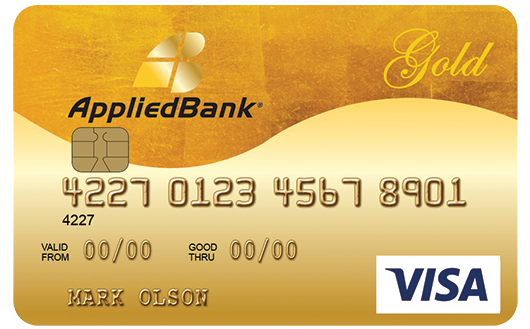 The Applied Bank® Gold Preferred® Secured Visa® Credit Card can be used at all of your favorite locations including grocery stores, gas stations, discount stores, ATMs and online! Activate Today with a refundable Security Deposit, Minimum $200, Maximum $1,000. Increase your credit limit up to $5,000 by adding additional deposits any time after your application has been approved. Access your account online and via your mobile device from almost anywhere. It's easy, fast and secure! Pay your credit card bill, check your balance, monitor your credit availability and much more. The Applied Bank Secured Visa Card has embedded chip technology for enhanced security and protection when making purchases at chip-enabled merchant terminals. If you pay your balance in full and close your credit card account, we'll refund your security deposit. † Approval of the Applied Bank Gold Preferred Secured Visa Credit Card is subject to Verification of residence, identity and ability to pay. Deposit will be drawn from the credit/debit/prepaid card provided. Obtaining Your Card: The USA PATRIOT Act is a federal law that requires all financial institutions to obtain, verify and record information that identifies each person who applies for a card account. What this means for you: When you apply for a card account, we will ask for your name, address, date of birth and other information that will allow us to reasonably identify you. We may also request a copy of your drivers license or other identifying documents to assist us in verifying your information.